These vocabulary word lists can help you find and practice words from the Academic Word List (AWL) in English Detective issues and on this site. If you are looking for a specific word, first look at Academic Word List Vocabulary A-B or its following pages.. Each word is listed in alphabetical orde, with its various common forms, followed by the newsletter in which it is practiced. Return to this page (or one of the following three) for links to the main practice page(s) for the words in each newsletter, along with crosswords, quizzes, and other practice. To see the newsletter itself (often with discussion of the meaning of some words, and with links to articles or talks in which you can read or hear them), go directly to the Back Issues page. These lists are only for words from the Academic Word List (awl.) For more information see Academic Vocabulary. Words taught or first introduced in each issue are listed. (Most of these words also appear in readings in later issues.) A number after a word shows the number of times it appears in the reading, if more than one. Note that in these vocabulary word lists, unlike in the newsletters, every form (word family variation) of a word is listed separately. Most people need to see and practice a new word a number of times in several contexts to remember it and "make it theirs." 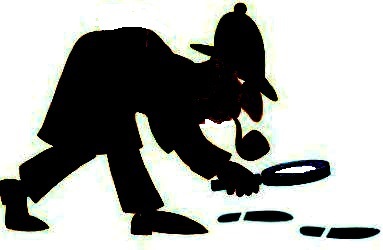 The purpose of English Detective is to provide that kind of practice, with 2 or 3 readings, explanations of some word uses, a practice activity or two (often including a crossword or other puzzle), and sometimes a quiz to check your understanding. Sign up using the form on the left (or at the bottom of the page for mobile devices) to get it in your email inbox, free, every month. You can practice these words in Be A Word Detective, Sherlock Holmes, Learn 19 AWL Words, and with the Investigations Crossword and Answers. Test your mastery with the Quiz on Detective Vocabulary. You can practice this AWL vocabulary at Scientific Method Vocabulary, Types of Germs Vocabulary Practice, More Practice with Science Vocabulary Words, Science Discoveries & Inventions (above), A Comprehension Check (on Discovery of Penicillin), and the Methods of Science Word Search. Test your mastery with the Science Words Quiz. You can practice these words at Vocabulary for Achievement, New Years’ Resolutions, Future Tense Practice, English Words for Success, Modals Practice, and a Goals for Success Crossword and Answers. Check your understanding with the Success Vocabulary Quiz. You can study and practice these words at Product Design Vocabulary, Teamwork and Cooperation Vocabulary, and the Design and Teamwork Word Search, as well as Adverb Clauses. Quiz yourself on them with the Technology Vocabulary Quiz. You can study and practice these words at Greek Roots, Vocabulary from Classical Roots, 50 Latin Word Roots Vocabulary Practice, Classical Roots Crossword, and Words from Greek and Latin Roots-- a Quiz. >>>For issue 6-10 on, click here., here for issue 11- 17, or here for issue 18 on. If you want to investigate further on your own, information on the AWL words in any text is available from Lexical Tutor. You can copy fairly short texts (a page or so) into the box provided, click “submit,” and get back your text color coded by level. Home > Learn English Vocabulary > Academic Vocabulary Word Lists.